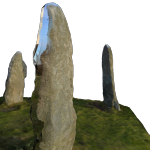 We are using a plugin called X3DOM to display our models, which means that you don’t have to download anything extra. Unfortunately, X3DOM isn’t supported older Apple handheld devices (earlier than iOS8; see the list of supported browsers here), so we have a static image gallery featuring pictures of each of our models. Rotate by left clicking your mouse and dragging. Pan by holding the Control key on your keyboard, then left clicking your mouse and dragging. 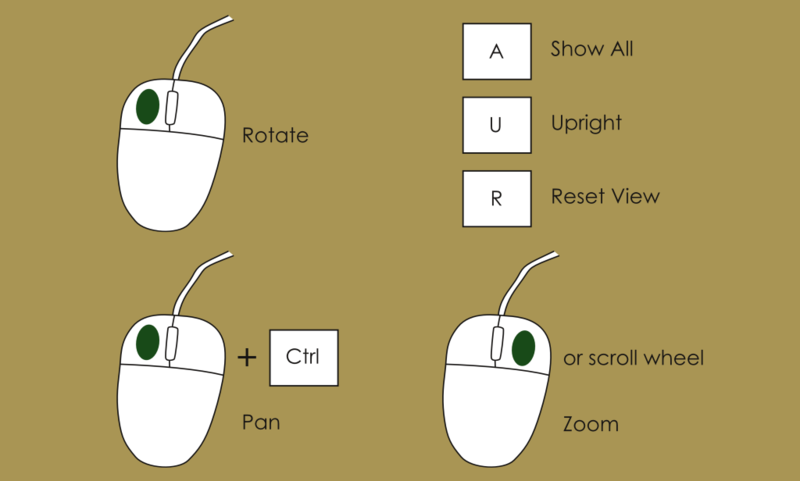 Zoom by right clicking your mouse and dragging, or using your scroll wheel if you have one. Press the A key to show the whole model. Press the U key to put the model upright. Press the R key to reset the camera view. 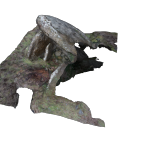 Sometimes there are problem areas in the models, usually because you can’t easily photograph an area of the monument. Here are some of the errors you will see in the models and why they have happened. 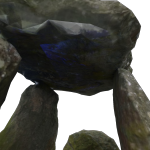 The blue patch on the texture was caused by the use of flash inside the dolmen. 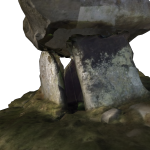 When you can’t easily reach the top of the monument, sometimes the photogrammetry will mistakenly add sky to the top – this is a very common error. The texture on the side of one of the stones has come out badly because a wall prevented good photographs being taken from this angle. 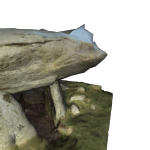 The original model of Maen-y-Bardd was missing the underneath of the capstone because no photographs covered that area. 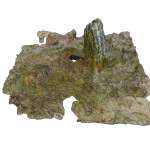 Remember that even if something goes a bit wrong with a model, it is still very useful to us. Sometimes they can be fixed by adding more photographs, and we will never say no to more photographs of the same site!